I was in Singapore three years ago and on my way from the airport to the hotel I saw a large banner-like announcement for an exhibition entitled “The Zhongshan Warship” and its treasures. I had not previously heard of this vessel but I was very keen to learn more. 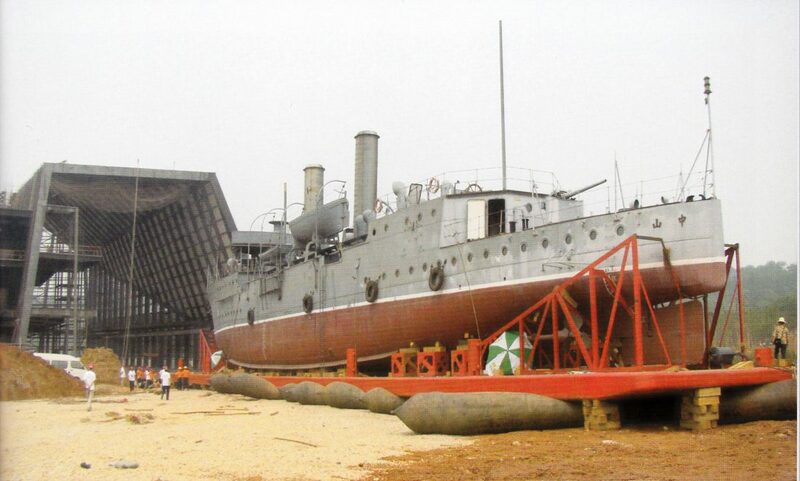 I found it of great interest, relating as it does to China’s Zhongshan Gunboat, which played a significant historical role, and in this blog I’d like to share something of it. 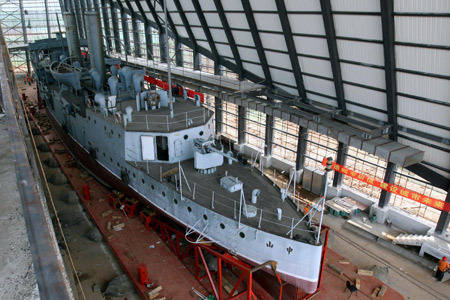 The exhibition – a traveling one – was organised by the Zhongshan Warship Museum of Wuhan, China, and was held in the Sun Yat Sen Nanyang Memorial Hall Museum. This was formerly the residence of one of Singapore’s most successful Chinese merchants and philanthropists in the late 19th and early 20th Century. 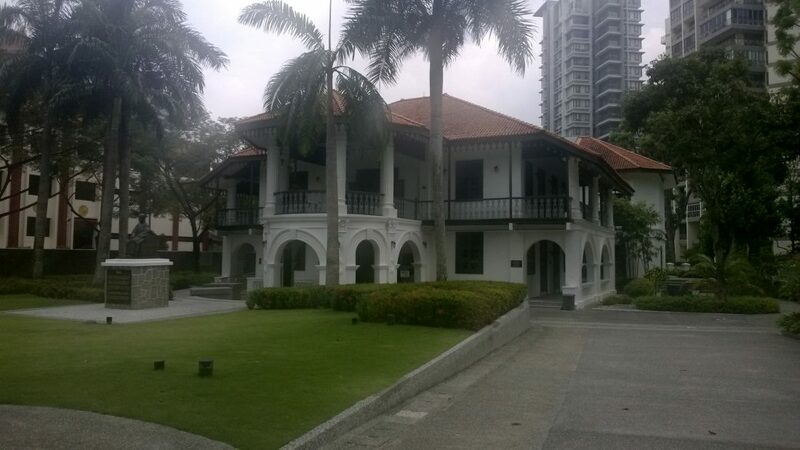 The museum covers not only the life of Sun Yat Sen (1866-1925), the revolutionary who brought about the fall of the Manchu (Qing) Dynasty in 1911 and who created the Chinese Republic that followed, but it also tells the story of the rise of the great Chinese business empires centred on Singapore. Sun’s story is dramatic in the extreme and I was not previously aware just what a large role was played in the revolution by the Overseas Chinese communities as regards funding and provision of support for political exiles and activists. The museum is splendidly housed and the organisation and range of exhibits make it a model of its kind. It is a must for any historically-minded visitor to Singapore. 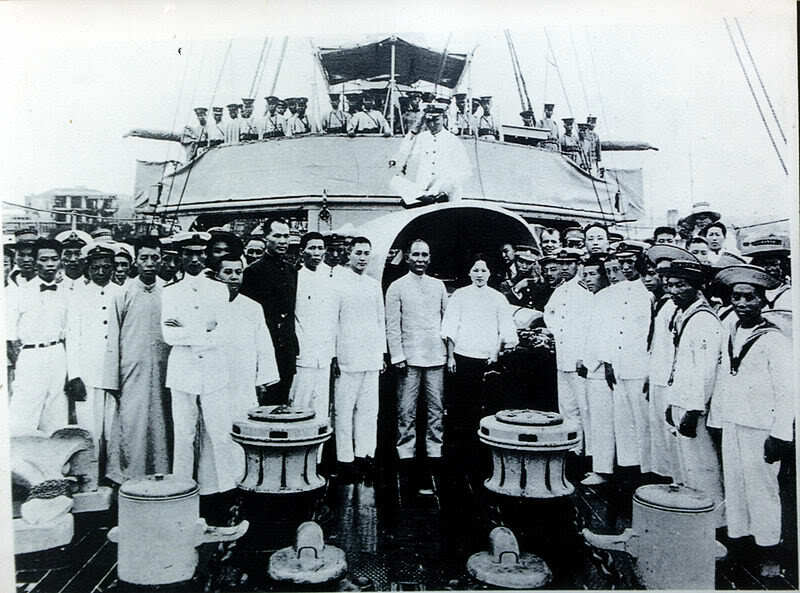 The presence of the Zhongshan exhibition at the museum was explained by the fact that the vessel, named after Sun Yat Sen (his name in Mandarin being Sun Zhongshan), was strongly associated with him, as well as with a number of other significant events in the years 1911-1937. Machinery: 1350 hp triple expansion, twin screws, max speed 13.5 knots. The design was well suited to operation either in coastal waters, or on China’s vast inland river system. By the time the Yongfen and her sister Yonhsiang were delivered the Imperial Government had fallen. The new republic was to face many challenges, not least an attempt by in 1915-16 by the first president, Yuan Shih Kai (1859-1916,) to proclaim himself emperor. Sun Yat Sen was a major force in frustrating this attempt. In the “Warlord Period” which followed, in which central authority was challenged by local strongmen who controlled vast areas with their private armies, naval units allied themselves with the “Constitution Protection Movement” which was pledged to defend the republic. In 1922 during further internal strife, Sun Yat Sen, who was still actively attempting to unify the country, escaped danger by taking refuge on the Yongfen for a period of 55 days. This included running past the forts on the Pearl River, close to Guangdong (Canton), which were controlled by the warlord Chen Jiong Ming (1878-1933) with both Sun, and his protégée Chaiang Kai Shek on board. 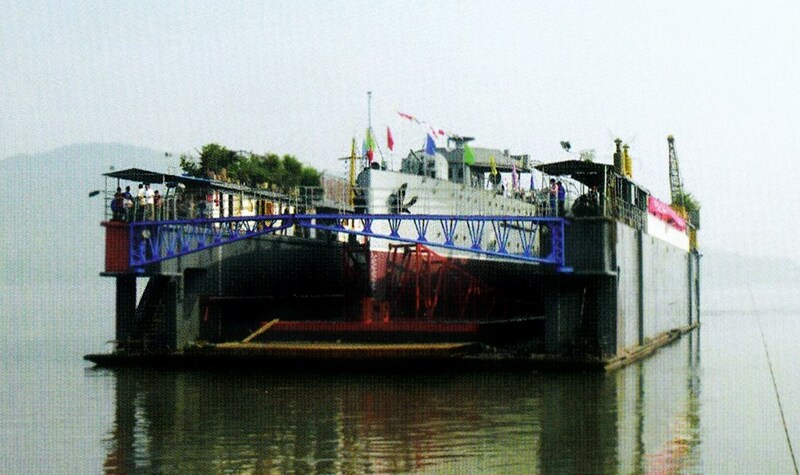 It was to commemorate this that the vessel was renamed Zhongshan. 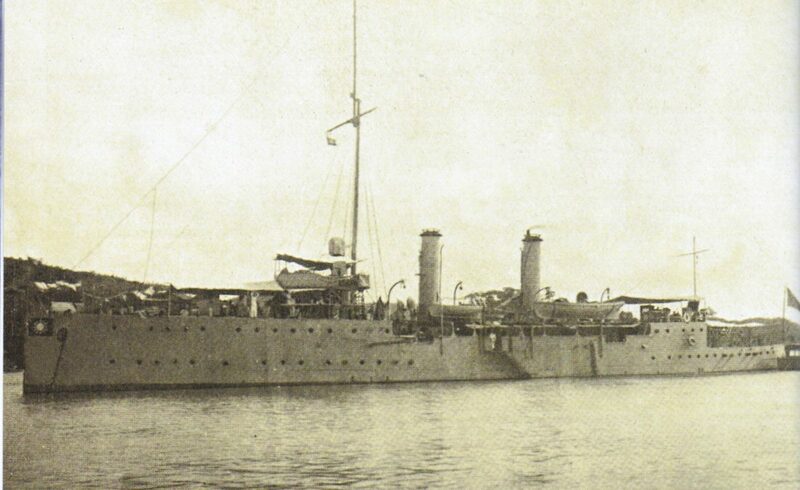 Under its new name the gunboat continued to have an active career, which included coastal operations against pirates. In 1937 however, when Japan invaded China (in what was essentially the opening of WW2, though few in the West wanted to recognise this at the time) she was deployed in the Yangtze River to oppose the Japanese advance westwards from Shanghai. On October 24th , near Wuhan, she was attacked and sunk by six Japanese aircraft, the captain and 20 of the crew being killed. The wreck was to lie undisturbed until 1996 when it was resolved to raise and refurbish her as a memorial to Sun. The hull appears to have been in remarkably good condition and after an eight-man diving team removed some 1500 tons of silt from her it was possible to raise her, between two barges, in February 1997. 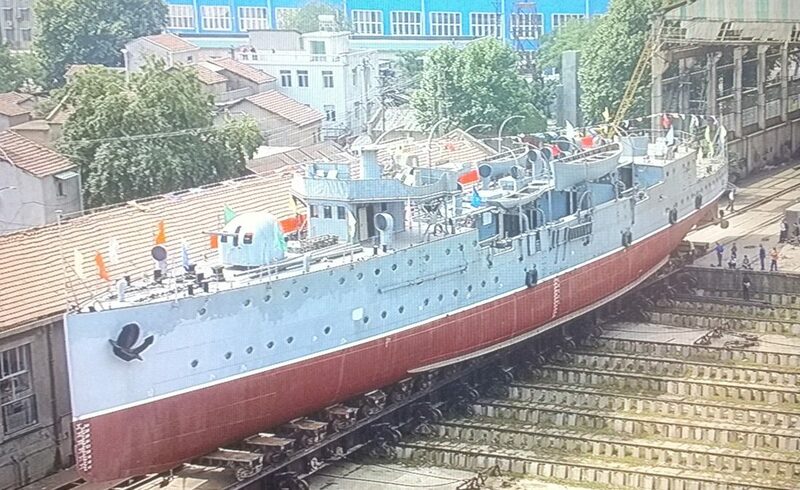 The hull was was winched on to a slipway for work to proceed on her and transported thereafter by means of a floating drydock to the custom-built viewing hall built for her near Wuhan. 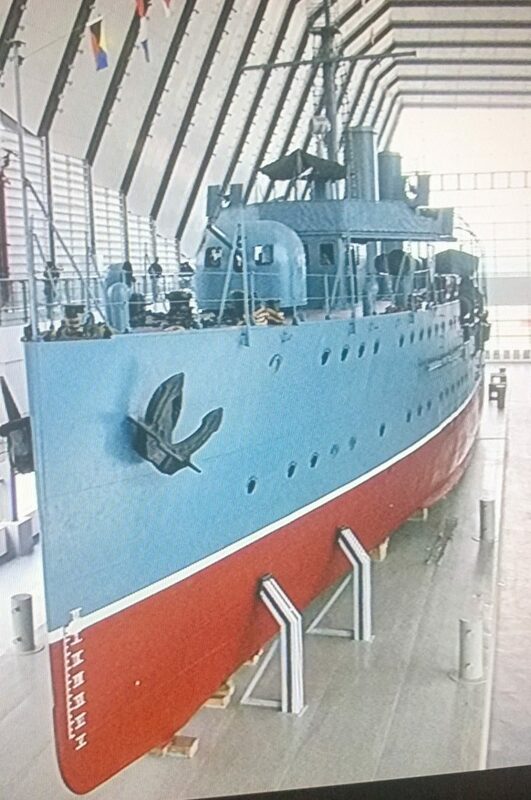 Final fitting out was done there, where she is now on permanent display.The photographs below give and idea of the very comprehensive work involved. 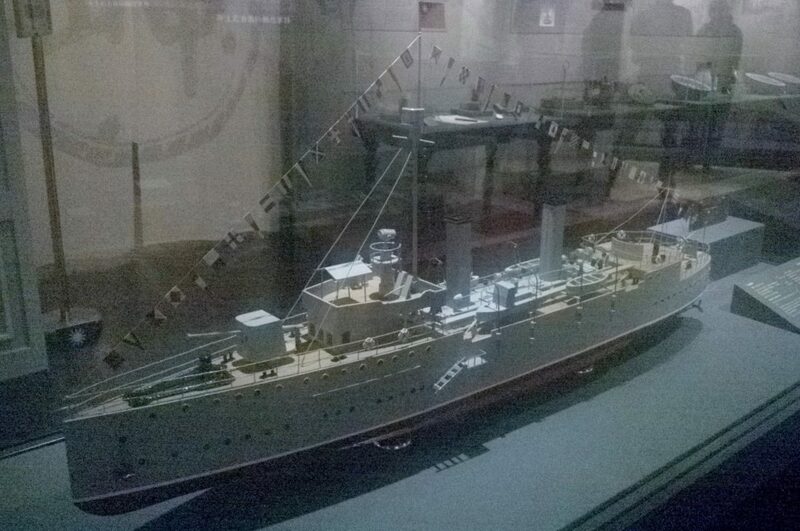 The exhibition that I saw covered all aspects of the vessel’s history and operation. It included a splendid 1:50 model and a large display of artefacts recovered in good condition from the silt, which probably acted as a preservative. 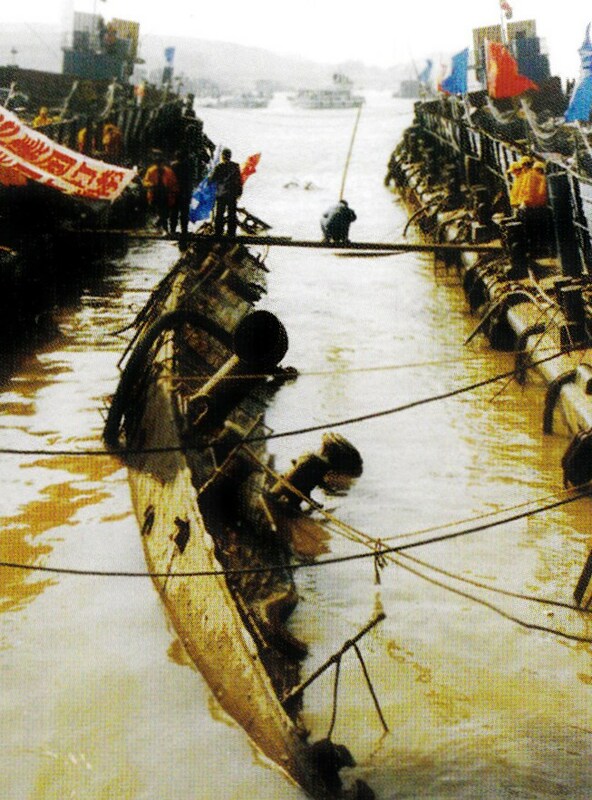 Seen together they present a poignant view of what life would have been on board the Zhongshan as she patrolled the Chinese coast and penetrated deep into the interior on the country’s massive rivers. For me the exhibition proved an unexpected joy. Due to the lighting however, and the fact that I had only a mobile ‘phone with me, and not a proper camera. The photographs I took of the model are therefore hazy. I have also taken the liberty of scanning photographs from the splendid exhibition guide and hope that by doing so I have not infringed copyright. 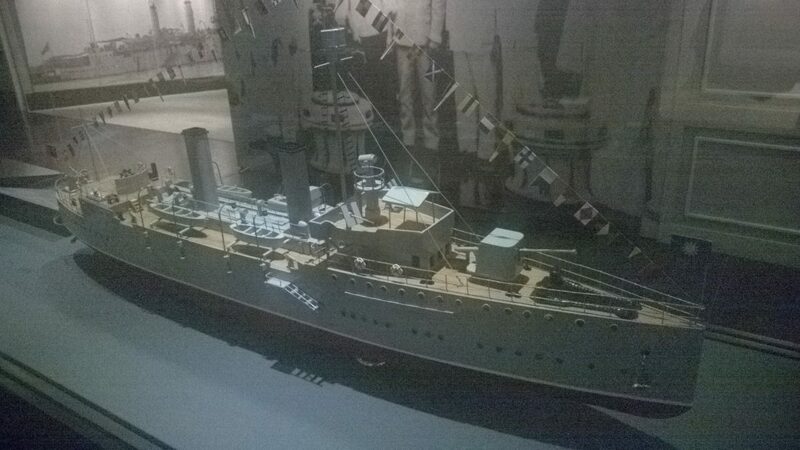 I trust that my thanks to the Zhongshan Warship Museum and to the staff in Singapore, as well as my desire to share the pleasures of the exhibition with readers who cannot visit it in reality, may compensate for this. It’s 1884. A fanatical Islamist revolt is sweeping all before it in the vast wastes of the Sudan and establishing a rule of persecution and terror. Only the city of Khartoum holds out, its defence masterminded by a British national hero, General Charles Gordon. His position is weakening by the day and a relief force, crawling up the River Nile from Egypt, may not reach him in time to avert disaster. Outnumbered and isolated, with only ingenuity, courage and fierce allies to sustain them, with safety in Egypt far beyond the Nile’s raging cataracts, Dawlish and his mixed force face brutal conflict on land and water as the Sudan descends into ever-worsening savagery. 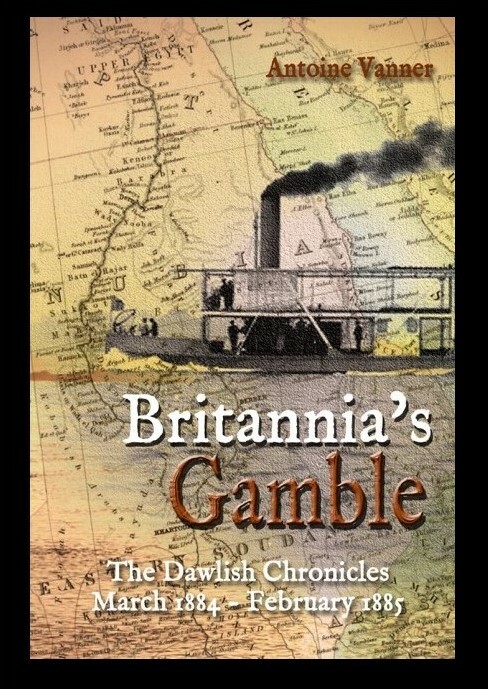 And for Dawlish himself, one unexpected and tragic event will change his life forever.